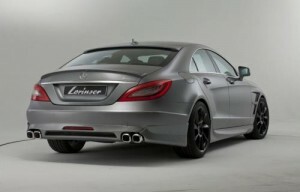 The old Mercedes tuner has finally unveiled its awesome new body kit for the latest Mercedes CLS. The luxurious four-door coupe benefits might have got a bit fat in its second generation, but Lorinser’s kit manages to cover most of the fat bits like a fancy dress. It now looks more muscular and sporty. The car looks as if it’s been hunkered down to the ground thanks to the new tall side skirts and the revised bumpers which add to the height and width of the body panels, the car also gets a boot lid wing, a roof spoiler, and new grille. All of those parts are finished in a lovely mate grey color and complemented by new set of rims available in different design. No word on performance upgrades or pricing yet.